This is both a wiki (a website editable by all) and a blog (an online diary about the stuff Alex Schroeder reads and does). If you’re a friend or relative, you might be interested in reading Life instead of this page. 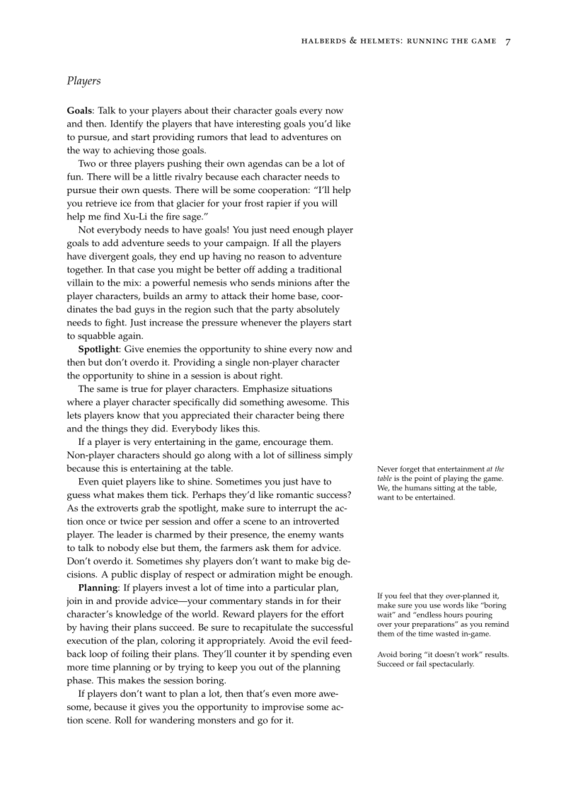 If you’ve come here from an RPG blog, you might want to head over to RPG. There are other similar categories to be found on the SiteMap. Für Rollenspieler gibt es ebenfalls eine eigene RSP Kategorie. I sometimes like to look at those larger maps with fewer mountains. I start speculating about this village being so close to the chaos temple; the small settlements at the foot of mountains with temples of law; I love how the humans try to avoid settling the swamps; how one would travel up river to find the source somewhere high up... In this respect, a map truly serves as an inspiration for the game. Generate some yourself using the Alpine generator for Text Mapper. If you’re wondering about the algorithm: here’s how to show its limits: if you start with just one peak, and a large enough map, you get an island centered arouond a volcano. Love this, I 100% agree. 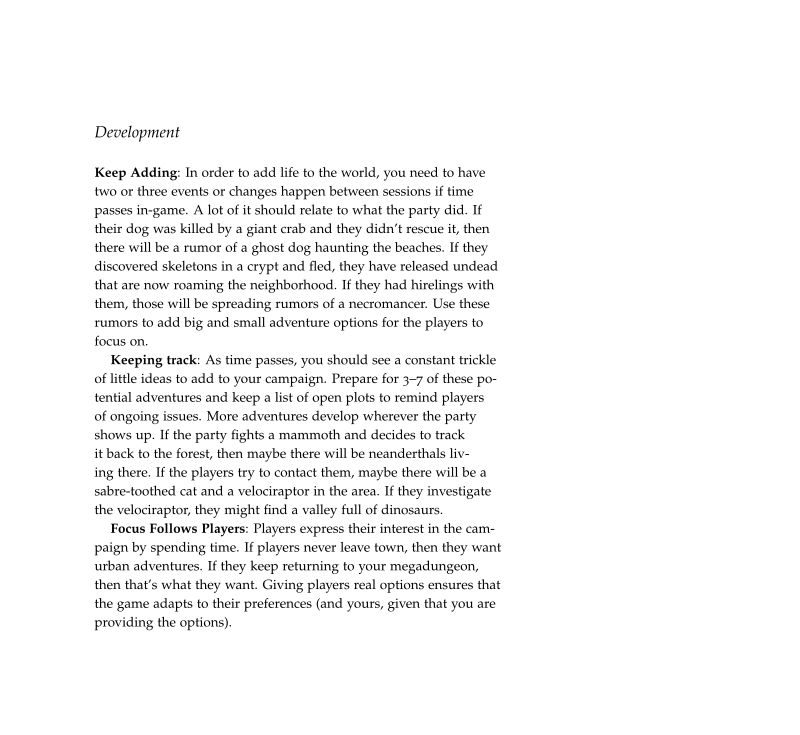 My gameplay and worldbuilding emerge from the maps I generate, not really as much the other way around. That reminds me, can I add your blog to the Old School RPG Planet? Yeah. Look at this! Somebody on Lasagna Social recommended an article about Gene Wolfe on Vice. When I look at the cookie preferences, it’s all blocked, too! But on a text browser, in this case eww inside Emacs, half a page down, it’s all beautiful! Screenshots of a text interface brought to you by the pinnacle of Internet technology and climate warming: the image, instead of colourful text. Wouldn’t that be great? 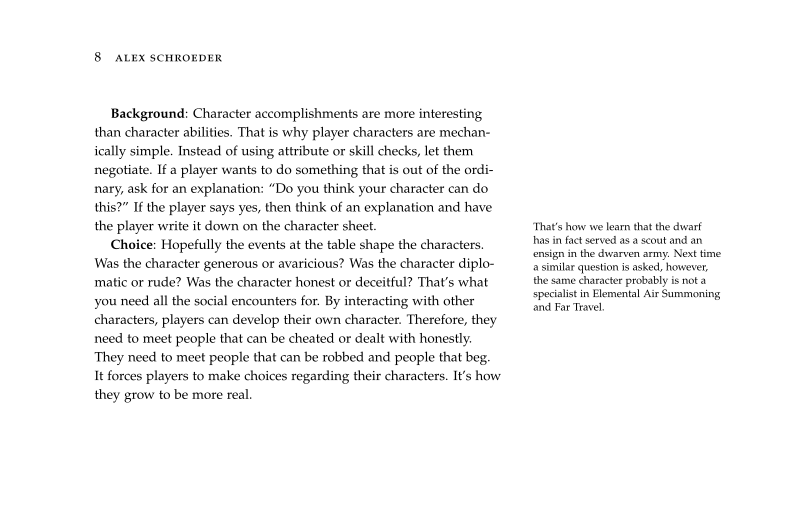 A screenshot tool for text windows that results in HTML in the clipboard or something? Does such a thing exist? Anyway, half a page down in lynx shows the same, readable result. So now we can have the best of both words: The web, as seen through tools written for an alternative future, where browsers are not bloated security hazards, the nuclear power plants we can’t live without but whose malfunction we constantly fear and whose operators we don’t trust. This is the simple web! So what did I tell them? They had the basics of HTML and CSS figured out, so that wasn’t the problem. It was trickier stuff. How to use the validator to validate the HTML and spot the problems. Using a DOCTYPE at the top. Closing the list. Stuff that doesn’t show in the browser. But the reason I had stumbled into this is because I wanted to add their blog to the Old School RPG Planet and had been unable to find the link to the feed. Since they’re writing it all by hand, they didn’t have a feed, obviously. Running the wilderness: one hex is one day on foot without roads, using a different random encounter table for every region, how to find their lair, or their tracks. It’s weird. Did I not blog about these issues before? Perhaps I only remember all of this because it all ended up in my Referee Guide. Oh well, if you have some links on the topic you’d like to recommend, leave a comment! Gundobad is at it again. This time he writes about barbarians, and more specifically, about the Goths under Alaric, and suggests to run a campaign where you’re leading your people into an empire, you need to fight, but you also need to make yourself useful, find allies, and so on. I’ve long been eyeing the possibility of having an army of 5000 mercenaries “back from the war” or a group like the Goths. I’ve always imagined them hanging around, moving back and forth across the sandbox, and my players mostly avoiding them. Surely we would find something interesting to do eventually. But at the beginning, it would just be the background to explain migration, starvation, other bands of bandits mobilizing, or orcs, or what have you, governors looking to hire muscle to defend their towns, to spy on the foreign army, all of that. Anyway, all campaigns need large scale destruction and upheaval and such elements of the Völkerwanderung make for a great campaign I’m sure. Altitude is measured in integers and it drops slowly. That is, on your way to the sea you might see altitudes dropping like this: 4 4 3 3 2 2 1 1 0. Thus, it sort flows in “steps,” and the way I had written it, once a river flows into the next hex and this hex has the same altitude, a swamp forms. Thus it had a swamp on every second hex. In effect the map showed “stripes” of swamps. The map also had no concept of “dry” land. As we move away from the mountains, however, there are fewer rivers. I was at a loss. How did the landscape look in ancient Germany, with fewer mountains and everything being flat compared to Switzerland? I hear the Romans thought it was heavily forested. But was it forest (dry ground) or swamp (wet ground)? I don’t know. So I went with forest. There can be swamps along the river, but without a river, there is no swamp. Right now, when I place a forest, it will grow up to two hexes into “dry” hexes without a river. In the image below, the forest on the left edge would be an example. At the same time, I now had a better idea of what “dry” land is: that’s the land that isn’t mountains, or swamps (along a river) or forest. Just for variety, I decided it should have some hills (for a while I had 50% hills but that seemed like a bit much so I reduced it), and grass. I had seen some nice prairie pictures on social media and wanted some grasslands even thought I don’t think ancient Switzerland had grasslands. In the image below, the grass lands in the bottom left would be an example. If you are interested in the icons, take a look at the Gnomeyland example. I’m listening to Roguelike Radio, a podcast about roguelike games (check out the wiki). Now I want to read the book Procedural Generation in Game Design, since I’m listening to the episode about it. I was talking to @dredmorbius who was mulling the categories to use for a blog. This is hard. I approach tagging from the perspective of “given this post, what other posts would a reader be interested in” – and from this perspective administration is different from politics of course, but what’s the difference between copyright and patents on my blog, if we care about grouping by usefulness (in my peculiar sense) and not ontology? In this case, the fact that they are both very different is not a useful category for the reader interested in all sorts of intellectual property issues. I think trying to use labels as a way to structure human knowledge and applying this to a blog, like a library, like an encyclopedia, is probably the wrong approach. In the much more limited world of a blog writer and reader, these ontologies are sometimes overly specific or useless given that I am Alex and you are you and you know the things I write about. So, given that you are looking at a blog post of mine, will the labels it has help you find the other articles you want to read? We need to make assumptions about inner states, intents, and all of that. I think sometimes we have the tendency to use a Dewey or Linnaeus style labeling system that describes the world but leaves the granularity up to the reader. Like, I almost never want to talk about specific plant species when talking about pictures. “Hippeastrum” (the genus) is fine. But other readers might still find the tag “Hippeastrum” useless because I am assuming they are interested in colorful plant pictures (thus, a broader interest). A tag like “Plants” is more useful for my blog. The labels I use need to reflect the discoverability needs of myself and my readers. I need to ask myself the question: given an interest in A, would it ever make sense to not be interested in B? If an interest in my blog and A most often implies an interest in B, then perhaps A and B should not be two different labels on my blog, for my readers (clearly not a usable thought for libraries). Thus, the need to merge tags: it probably makes no sense for me and my readers to differentiate between copyright and patents because even though there are differences, legally, culturally, economically, historically, for the context of my blog and my readers it makes no difference. As I was tweaking around with Text Mapper I decided to go and make it easier to explore the tables that come with Hex Describe. I mean, you can always follow the link to the tables and look at the huge text file. But I wanted something better. I want to click around! For example, assume you’re curious about the centaurs. Go to the explore rules section, click the submit button, search for centaurs, and click the link. You should end up on the centaurs page. From here, you will get linked to centaurs entry in hyperlinked version of the tables. Hopefully exploration is now easiert: having found the centaurs rule, you can click through to centaur → strange male name and figure out how the names for centaurs are created. I guess a list of “top level” rules at the top would be great? 0 days since last facebook scandal. Ouch, this hurts! With links to sources.